In stock -This product will ship today if ordered within the next 4 hours and 14 minutes. 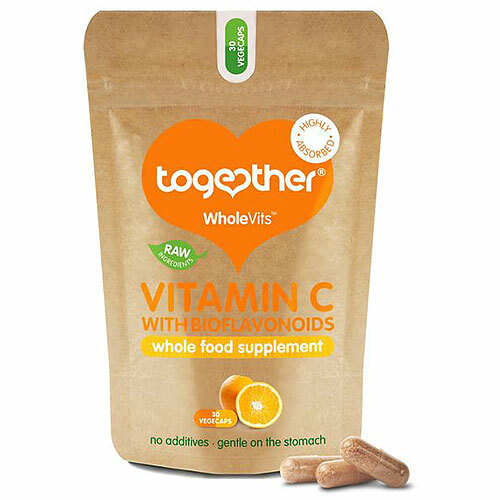 Together has taken all the goodness from one of nature’s finest offerings and made their WholeVit Vitamin C with citrus fruits. Our bodies better absorb Vitamin C when it’s in a whole food complex, complete with naturally-occurring bioflavonoids. These bioflavonoids not only help Vitamin C absorption in the body, but also offer their own health giving properties. Vitamin C with Bioflavonoids incorporated in citrus pulp Capsule shell (Vegetable Cellulose). Take one to two capsules daily as a food supplement with or without food, or as directed by a practitioner. 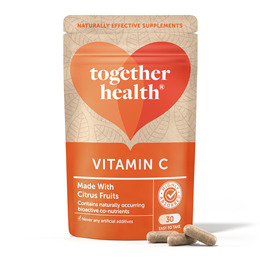 Below are reviews of Together Vitamin C with Bioflavonoids - 30 Vegicaps by bodykind customers. If you have tried this product we'd love to hear what you think so please leave a review.